With so many computer peripherals that are used today it is inevitable that wires are becoming cumbersome. Everyone is familiar with the pain of connecting and reconnecting all wires to your computer and than stashing in behind the table in hopes to never deal with it again. Perhaps one of more exciting trends in computer industry has been conversion of peripherals such as mouses, keyboards and HDTV tuners to wireless technology. It is almost inevitable that many more will follow this trend. What we have here is an Atlona AT-HDAir Wireless USB/HDMI adapter. At the core of it’s purpose HDAir makes wireless screen possible. Now that’s an exciting possibility. It is a wireless USB to HDMI adapter and it’s something that showed up on the market only couple of months ago. Atlona is promising that this is their first step on the road to more wireless technology. 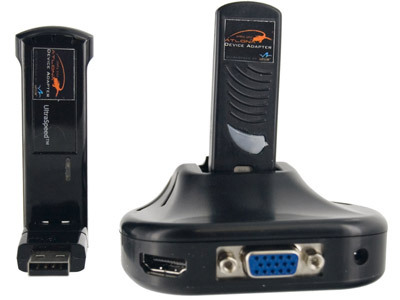 The Atlona AT-HDAiR is designed to connect any Windows Based computer to either your HDTV or Computer Monitor wirelessly through VGA or HDMI Connections. The HDAiR is based on a powerful UWB technology, allowing users to extend high resolution content up to 30 feet away. Atlona adapter is capable of supporting resolutions up to 1400×1050 or 720p. Whether wirelessly connected to a projector in a meeting room or to a flat TV screen in the living room, the Atlona HDAiR allows users to easily and conveniently extend their PC visual workspace. Providing both HDMI interface, common in flat TVs, and VGA interface, common in projectors and computer monitors—the HDAiR provides users with the flexibility. Both HDMI and VGA output connections are active at the same time, therefore HDAiR receiver could be used to power up 2 displays at the same time with identical content. NOTE: HDMI Output will only transfer video signal. AT-HDAiR is not yet able to support Audio. Here’s another awesome way to stream those HD videos from your laptop on to your HDTV. If you’re looking for an alternative though, I suggest trying out the Netgear Push2TV product. This device makes use of the HDMI port on the HDTV and acts as a wireless adapter, displaying what you see on your laptop on to your HDTV. So instead of connecting the laptop via an HDMI cable, the Netgear Push2TV takes its place, and wirelessly streams the contents of your laptop even if they’re in separate rooms in the house. To know more about Netgear’s Push2TV product, just check it out here, http://bit.ly/bByST7. I’m sure you’ll love it too.